On the eve of World War II (1939) English officer Ralph Denistoun is in Nazi Germany on an espionage mission to recover a poison gas formula from Prof. Krosigk. He is helped by Lydia and her band of gypsies. Naturally romance develops along the way. 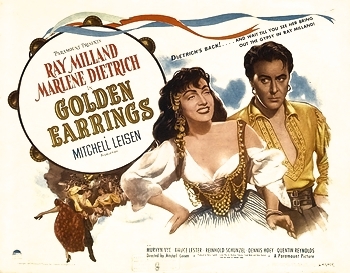 The film’s haunting song, “Golden Earrings”, sung in the movie by Murvyn Vye, was a hit recording in 1947-48 by Peggy Lee. Peggy Lee, Collector Series Vol. 1 The Early Years, Capitol CDP 7 93195 2. Dinah Shore, The Great American Composers, Jay Livingston & Ray Evans, Columbia House 2C2 8651 / C21 8651. Bobby Darin, Winners, Atlantic Records. The Ray Conniff Singers, Somebody Loves Me, Sony Music Entertainment. Willie Nelson, Without A Song, Sony Music Entertainment. Jon Weber, Plays The Songs Of Livingston & Evans, MD-1111. Frank Sinatra, from the radio show YOUR HIT PARADE. The Fred Waring Orchestra, from the Fred Waring Radio Show.